This module is so simple, I'm surprised it has not been thought of before. You can fit a PIC16F84A or PIC16F628 and it becomes a "buffered PIC chip." Look at the circuit diagram first to see what the module is doing. It's buffering 5 of the input lines with a 1k resistor and buffering 8 output with a driver (actually a sinking) transistor. A HIGH is detected on inputs RA0 - RA4. OUTPUT is between 12v rail and pins RB0 - RB7. If you fit a PIC16F628 chip, you can use the RC oscillator inside the chip (4MHz or 37kHz - see 14.2.6 of PIC16F628.pdf ) or the external RC 4MHz oscillator components (4k7 and 22p) on the PC board. The oscillator components on the PC board do not have to be removed when using the internal oscillator. The small current delivered by the 4k7 resistor in the RC oscillator will not damage the chip. It just represents wasted current. The 5 input lines are protected with 1k buffer resistors and taken to an "in-line" connector-strip. The 8 lines of port B are buffered with 1 amp driver transistors and taken to another connector-strip. A Reset Pin is also on the PC board. When it is taken LOW, the chip resets. It is held HIGH via a 10k resistor. This module does not allow the full in/out capability of each line but it is miles ahead of anything available on the market for a similar price. In fact the closest modules are twice the price, have less input/output capability, run at one-tenth the speed and have less area for a program. The advantage of our design is it does not have any "overhead." It does not have any propriety software or hardware that you have to buy. You can take the chip out of the module and place it directly into a project you have designed, and it will run immediately. The microcontroller runs at 1 million instructions per second and this is very important when you are working on timing intervals, for displays and sounds, etc. Library of Routines, and examine the experiments we have presented, you will be able to go to our "Copy and Paste" file and put the code into your program to create all types of effects. There are a number of sites on the web to help you write assembly programs but they tend to complicate the job rather than simplify it. I have tried them and found them to be absolutely impossible to use. The author has opted for machine code assembly, not because I am a masochist, but because it is the only way to learn the instructions and achieve a program of the complexity of the ideas we have presented in some of your projects. Two games on this site are examples. To give you some idea of the capability of a 1,000 instruction program in machine code, the first 4-level chess game was written for the early version of the Z-80 in 1k of memory! The PIC chip has instructions with more than twice the power . . . imagine what you can achieve! But don't forget, the chess game was not written in simple "linear programming mode." The routines were very clever algorithms. Our programming approach is much simpler and is called "linear programming." Basically it means the micro will be advancing down the program and exiting a sub-routine with a solution. Another reason for choosing machine code is fault finding. By viewing the program you can see exactly what the micro is accessing and it is much easier to "hunt down the fault." MPLAB has a debugging program and a single-step feature that shows the contents of each register (file) after an instruction. It has some capability at finding a fault. But don't hold your breath. It doesn't solve problems for you. 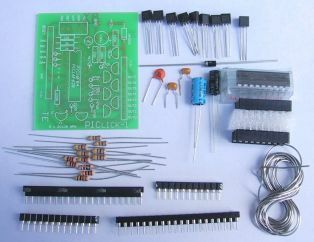 It's handy to see the contents of W and the result of an instruction as well as where the micro is jumping to, but it is very complex to set up and use. The author has opted for a much better approach of inserting a set of instructions at a particular location and outputting the contents of a file to an 8-LED display. Its a faster approach and shows what is really happening. You can use the 8 LEDs on the PIC LAB-1 for this. The other advantage of our method of producing a program in Machine Code is portability. 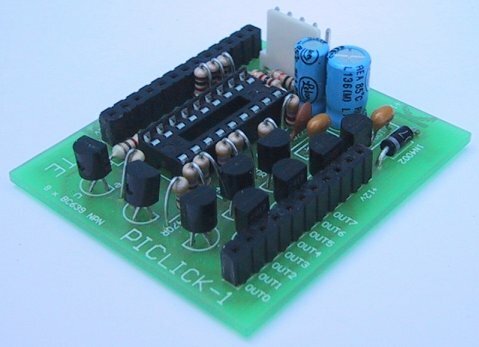 Once you get an idea working on PIC LICK-1, the circuit can be transferred to a new PC board at the lowest cost. There are no unnecessary chips and no propriety software to buy or rent. All the software is FREE. In the author's opinion, it's the ONLY way to do things. I can see quite clearly why this type of development-system has not been done before. There is no monetary rewards to the designer. But that's not our intent. If, in the process, we create employment, business opportunities and ideas for exam projects, our goals have been achieved. All our projects for the PIC chip can be classified as "tools." They help you design and develop ideas in the micro world. They are "building blocks," or "modules," to help create a design. And that's why we called it the PIC LICK-1. It licks anything the author has seen, in - price - capability - and speed. In simple essence, the board is a PIC16F84A with a full port of high-current drive-lines and a set of 5 buffered inputs. 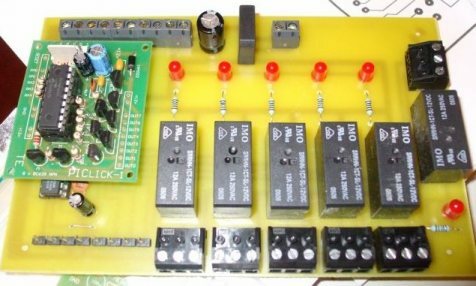 The circuit for this module is very simple. It's really just an extension of PIC LAB-1. Port A is used as an input and Port B is an output. This gives 5 input lines and 8 output lines. The input lines to the chip are protected with 1k resistors. This resistor has no effect on the chip detecting a HIGH or LOW as the input impedance of the chip is very high. The output lines drive buffer transistors and these are also protected from damage by the inclusion of the transistor. This makes the module "damage-proof." Although the circuit is very simple, it needs some explaining. 2 - 100n monolithic capacitors "monoblock"